A month later I flew to the Free State to assist with caring for my brother who was being discharged from the rehabilitation clinic back to the farm. I spent 10 weeks on the farm, maintaining my no to very little carbs lifestyle and enjoying all the fresh fatty meat produce from neighbouring farms and the fresh veggies that my nephew grows. It was fun walking around and harvesting and eating all the fresh produce. Without my knowing it I was already partially following a low carb high fat diet. There was no internet connectivity so I was just doing what I thought seemed OK. There was also no scale on the farm but I could tell that I was losing weight and on my return home the first thing I did was climb on my scale. I was 13kg down and I was feeling so good. What happened next was my family all got together for a welcome home meal and I was paid so many compliments on my new look. My son, who was looking lean himself although he’d never been overweight, asked how I had lost the weight so I explained how I had eaten while away on the farm. I was blown away when he and his girlfriend suggested that I get the new Tim Noakes book The Real Meal Revolution. They had started following the lifestyle a couple of months earlier via the downloaded e-book as his check up had not been too great and he was in danger of losing his vitality points due to raised BMI. I ordered the book and had to wait a couple of months for it to arrive, in the meanwhile I became an avid online reader of all things LCHF, banting, keto and paleo, learning good fats from bad fats etc. I met with a lot of resistance from people about my new lifestyle but I persevered and the weight kept falling off. I felt healthier and happier every day, I was more active and started walking more. I went back to the farm twice more for companionship and caring of my brother and at the end of my last visit I was walking long distances and feeling the benefits of a healthy lifestyle. On my return in August 2014 I went back to my doctor, one year after the previous visit and had all the tests done again. The results were a totally different story – By then I was20kgs down, my cholesterol was the lowest it had been in 15 years, blood sugars were perfectly normal, no sign of thyroid issues and my blood pressure was perfect for my age. I have to admit that I had been concerned about certain aspects due to all the negativity and bad publicity. And now I have lost a total of 28.2kg and would like to lose 5 to 10kg more. 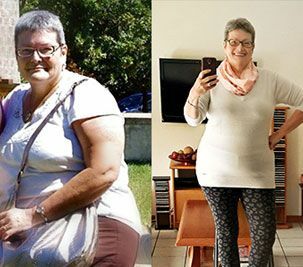 I had actually hit the 30kg loss mark by 25 December 2014 but I gained a bit because with all the walking my right knee totally collapsed so for 2 months I couldn’t exercise, I couldn’t shop and relied a lot on others for assistance. I had a total knee replacement at the end of February 2015 and for the first month relied on others to cook for me but I am now back in control of my own kitchen, I am walking and exercising my knee on an orbitrek machine so hope to see the last of my weight drop over the next few months. When I saw a physician specialist pre op to check if I was fit for surgery he commented on my blood results and asked me if I was banting. He could tell because the HDL particles in my cholesterol test were up and healthy and the LDL were down. He told me he was investigating and starting to eat the LCHF way himself. My final comment on Banting is It may not be for everyone but I believe that if you do it properly, educate yourself on good and bad fats, work out portion controls and not believe it is a licence to just eat everything, then it is the way of the future. I will never stop eating this way. My family all follow this lifestyle now, my husband, my son (who passed his last vitality exam with flying colours btw) and his girlfriend, my daughter, son-in-law and our two grandsons. And we are all so much healthier and happier. I have not had any upper respiratory infections or colds and flu since just before the winter of 2013. I no longer listen to the lies and brainwashing of the past 3 or 4 decades and don’t the food pyramid as we know it. I know now that it ridiculously flawed. I try as much as possible to eat sustainably and buy affordable produce to suit our budget from ethical local suppliers.